Put all ingredients into a blend and blend on high until smooth. 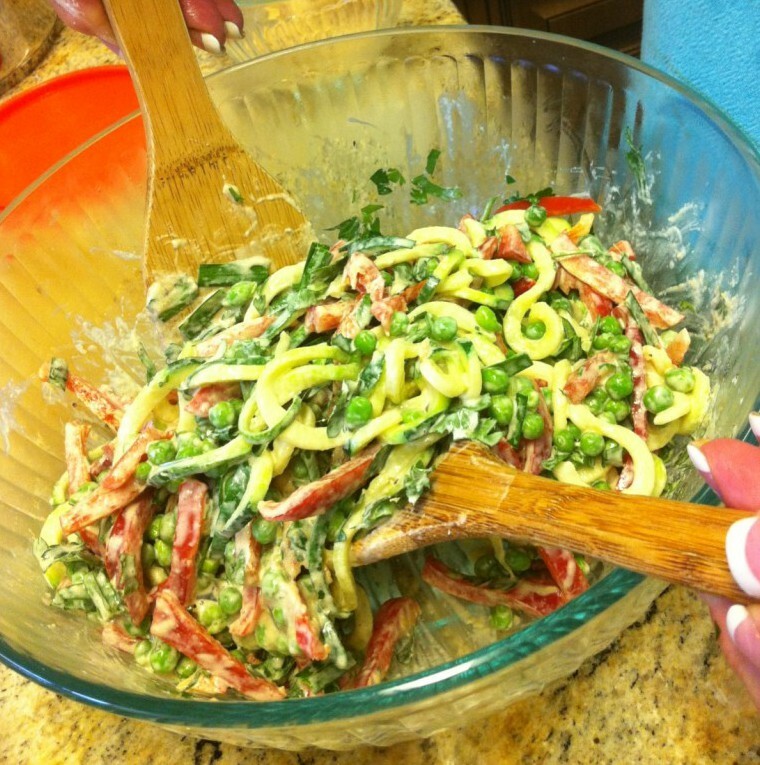 Prepare spiral zucchini noodles and desired vegetables. We used red pepper and peas. I also recommend shitake mushrooms or shaved carrots. Boil a large pot of water seasoned with himalyan salt. Remove boilng water from heat and emerge zucchini noodles in water until warmed through. Drain completely and immediately toss with sauce and additional veggies. Enjoy! I include tahini in many of my meal plans for clients. One of the biggest reasons is its choline content. Choline is an essential nutrient that aids nerve impulse transmission, the process of learning, memory, sleep and helps form membranes between cells. Read more. This entry was posted on May 7, 2015 by thrivecoach12 in Other-Main Dish and tagged Fairview Heights Nutrition, Longevity, Pam Faulkner Recipes, Tahini Recipe, Thrive Coach 12 Recipes, Zucchini Recipe.